This is just a snippet about phonics. 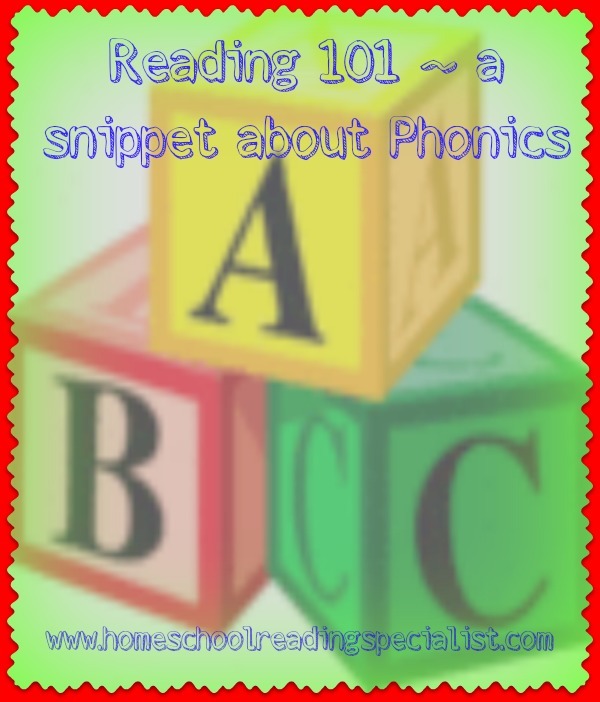 If you are using a curriculum that incorporates all the components of a well-rounded reading program, you likely have a good phonics program. I have included a chart at the end of this post that shows the progression of how a child moves through various stages of reading to become a proficient reader. The progression of phonics skills are shown in this chart. Your reading program should have readers or some type of text that allows your child to practice reading words that contain the sounds they have learned. In the world of reading this is called controlled text or controlled vocabulary because the text is controlled – the words are selected based on the sounds they have learned to that point. This is very important. This is where your child will apply the reading skills he has learned. Be sure your curriculum provides ample opportunity to practice reading connected text. Review, review, review! Don’t move on to the next stage until your child has mastered the previous step. If you’re working on sounding out 2 and 3 letter words and they aren’t getting it, don’t move on to harder skills. Practice, review, keep working at it! Children need a solid foundation in phonics. Time4Learning.com has a great chart that shows the progression of phonics skills. Get it here.